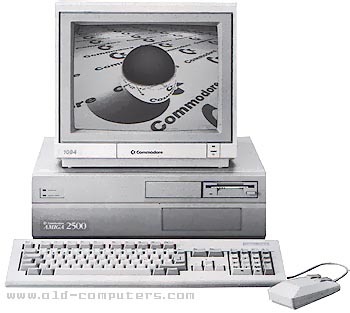 The first Amiga 2500 model was released during 1989 and was most popular in the US and Canada, appealing to the high-end user and professional market. There was very little difference from previous revisions of the A2000, the most notable being the addition of processor cards increasing the system speed. This resulted in a 3X speed increase and much more if you had math intensive packages such as 3D graphics packages IE: Turbo Silver etc..
Later onwards The A2620 was replaced with the faster A2630 which included a 25Mhz Motorola 68030 (With integrated MMU) and the much faster 68882 FPU, this combo could increase general speeds to 6X stock A2000 speeds. This board also shipped with 2Mb of 32 fast RAM or special ordered with 4Mb. Like the A2620 the 2Mb board could be upgraded by soldering in 16 ZIP chips, which usually was done by authorized service centers. The two accelerator boards were both sold seperately for upgrading A2000/A2000HDs to the identical A2500 speeds. The price for these boards were extravegant at first with the first A2620 retailing in the $5000 Canadian dollars range on their release! Later on the boards became less popular as third party products from companies like GVP included faster performance, built in HD controler and much easier to expand memory systems. There was a board made by DKB called the 2632 which attached to the back of a 2630 and added up to 128 megs of RAM. This board is extremely rare. see more Commodore AMIGA 2500 Ebay auctions !